From the Facebook of Hickory Edwards. Cropped to fit this space. Mile-marker posts were used at Standing Rock to show the origins of the protestors and how far they’d come to be part of the movement. Some came forty miles; some came four thousand. The post, while not itself a treaty, is a fitting symbol in the show. Altogether, the museum displays eight treaties out of the 374 that were ratified between the United States and Native peoples. Most of those treaties have been broken or violated by the United States. 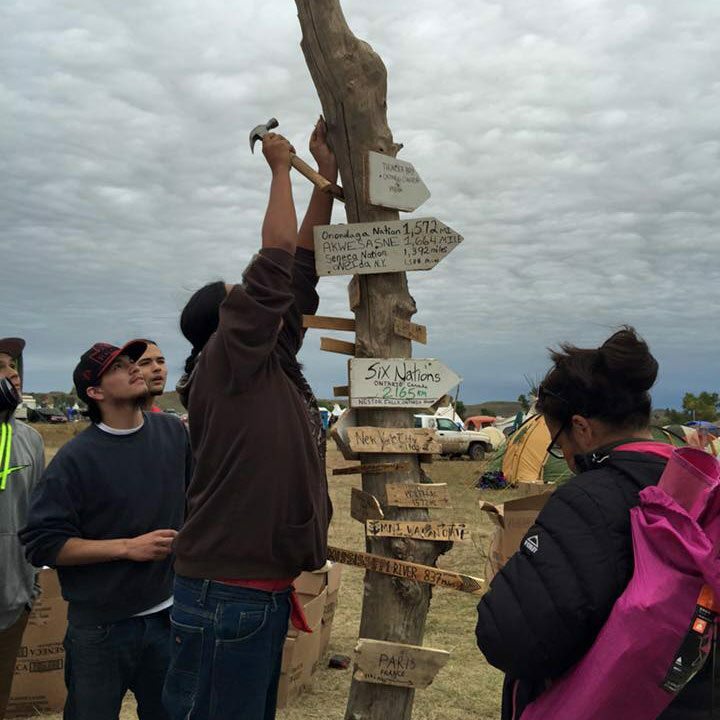 The milepost represents a historically significant push back against government encroachment on Native lands. The NMAI isn’t the only one to document history as it happens. The New York Historical Society, the National Museum of African American History and Culture, and others have been known to send staff to protests and other events to gather memorabilia. “Any moment when America is debating its identity, it’s crucial to collect it,” Lonnie G. Bunch III, director of the National Museum of African American History and Culture, told the New York Times. As America seems to be debating its identity quite a bit these days, there’s a lot to collect. But in evaluating this trend toward collecting ongoing history, it is important to underscore the shift in cultural role that museums are taking on. It is a well-known maxim that history is written by the “winners.” Indeed, it isn’t often that museums focus on or even document the historical experience of American Indians or people of color. The launch of new institutions such as the Museum of the American Indian in 2004 and the National Museum of African American History and Culture last year—both dedicated to uncovering some parts of our history that have been left out of the standard US historical account—of course are responses to this gap. Clearly, these emerging cultural institutions have decided they must perform the museum curatorial function differently than their white institutional counterparts to be effective. By documenting protests as they happen and installing the artifacts in museums while living memory is fresh, these curators and communities seek to be actors in current disputes, as well as engage the public in questions regarding our larger historical narrative.